The rubber water pipe is naturally used for water supply. The mechanical strength and special performance requirements of the rubber compound are not particularly high. If the production of pure natural rubber is too high, many rubber products manufacturers use natural rubber and tread reclaimed rubber. Reduce the cost; tread reclaimed rubber as a product of waste tire tread rubber powder, its low price, good elasticity, high mechanical strength, good compatibility with natural rubber, used in the production of rubber water pipes can be described as "not humiliating" mission". 160 parts of tread reclaimed rubber, 100 parts of natural rubber, 100 parts of tire rubber powder, 6 parts of sulfur, 1.5 parts of accelerator, 10 parts of zinc oxide, 2 parts of stearic acid, 2 parts of paraffin, 10 parts of mineral rubber, anti-aging agent 2 Parts, 200 parts of calcium carbonate; total, 593.5 parts. A. Compound: Tread reclaimed rubber, natural rubber and butyl rubber are less watertight. In order to ensure good water supply performance of rubber water pipes, manufacturers should use high-grade tread reclaimed rubber and improve rubber water resistance. 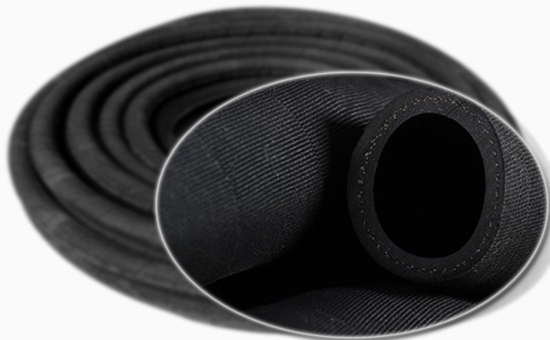 Permeability; ultra-fine tread reclaimed rubber has better compatibility with natural rubber, and on the other hand can improve the mechanical strength of rubber water pipes. B. Vulcanization accelerator: General-purpose rubber accelerator DM is easy to disperse and not pollute in rubber compound. Tread rubber, natural rubber and rubber hose produced by rubber compound can be used as accelerator DM and sulfur, zinc oxide and stearic acid. With the use of. C. Filler: The rubber filler commonly used in the rubber industry is light calcium carbonate, but compared with light calcium, heavy calcium carbonate can not only increase the volume of the product, but also improve the tensile strength, tear resistance and wear resistance of the vulcanized rubber. The rubber pipe with reclaimed rubber and rubber powder as the main raw material is most advantageous, so the calcium carbonate in the above formula should be selected from heavy calcium carbonate. D. Softener: Mineral rubber is a kind of refined petroleum asphalt with similar elasticity and certain elasticity. It has low price, can promote the uniform dispersion of filler in the rubber, and can improve the smoothness of the surface of rubber products. In fact, this is the most suitable softener. E. Anti-aging agent: In the tread reclaimed rubber/natural rubber combined with the production of rubber water pipe formula, it is necessary to add a certain amount of anti-aging agent to delay the aging time of the rubber water pipe. The anti-aging agent D is a general-purpose anti-aging agent, for heat, oxygen and flexing. General factors causing rubber aging, such as cracks, can provide good protection. They can be used in rubber water pipe formulations. Do not use more than two parts to avoid blooming.